Almir Sarayamoga Suruí, the Amazonian tribal chieftain of the indigenous Suruí people, is a leader in the fight to save the rainforest not only for the preservation of his land and people, but for the Earth’s and humanity’s survival as well. 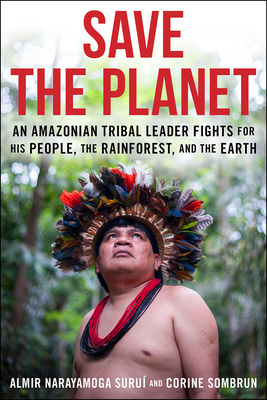 Joining forces with such high-tech corporations as Apple and Google Earth, Suruí has become a guardian of his people and a global activist, despite death threats and million dollar bounties on his head. A recipient of the Global Citizen Award in 2012, Suruí has calculated the direct cost of the loss of our rainforests—"the lungs of the Earth”—in terms of the total amount of Co2 that their destruction would release into the atmosphere, and the monetary loss that this would entail, and by using this carbon deficit formula, has leased access to pharmaceutical and cosmetic companies who have joined him in the stewardship of these endangered lands, their flora, fauna, and people. Almir Sarayomaga Suruí was the first member of his tribe to graduate from college (with a degree in biology) and the youngest of the Suruí tribe to be made chief, at age 17. He has traveled the world to unite the indigenous people of the equatorial rain forests in their fight to save these vital regions of the earth. Corine Sombrun is an adventure and environmental journalist whose books include Journal of an Apprentice Shaman and In The Footsteps of Geronimo. Julia Grawemeyer is a professor of French Literature at Denison University, Granville, Ohio.